Click or Tap Heatmaps will help you determine where your visitors are clicking. Tapping will be tracked if they are on a mobile/tablet. These Heatmaps help you quickly uncover issues with your page - for example, are visitors clicking your links? Or are they clicking areas that aren't links? To ensure that Hotjar accurately reports where your visitors have clicked, we collect clicks relative to elements on the page. For instance, if a visitor clicks on a button, we will record the position of their cursor relative to that particular button, not the entire page. Check out our Heatmap Guide to discover how click and tap Heatmaps can help you identify and understand user behavior. Hotjar records the position of the user's mouse cursor every 100ms, or 10 times per second. We periodically send this data back to the Hotjar servers, and it is later used to generate your movement Heatmap. Since we track the position every 100ms, your move Heatmap may initially look like a click Heatmap when it has a few pageviews. However, once you collect enough data, you will notice patterns emerging revealing the most used areas on your page. 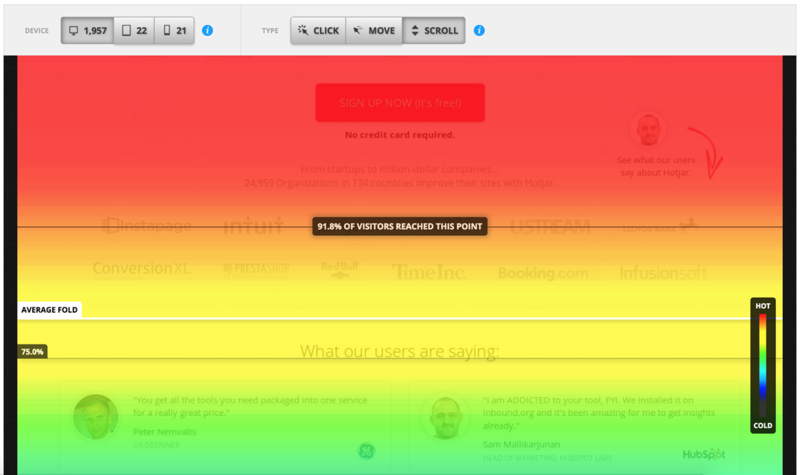 Hotjar tracks how far each of your visitors in your Heatmap report scrolled down while browsing your page. This data is presented by analysing the amount of visitors to the page versus the depth each visitor scrolled to on your page. Check out our Heatmap Guide to discover how scroll Heatmaps can help you identify and understand user behavior or reach out to our Support team with the Contact Us button below.